In the 1850s and 1860s, Greenwood was largely agricultural with much undeveloped land. Ownership of slaves was prevalent with slaves outnumbering white residents in Albemarle County. ​Familiar estates like Mirador and The Cedars were well-known as were the people who lived there. Trains carried people from Charlottesville to Staunton by way of the tunnel, a modern marvel designed by Claudius Crozet that was recently completed in 1858. There was a train stop at Greenwood Depot, but horses and buggies were the main source of transport in the area. 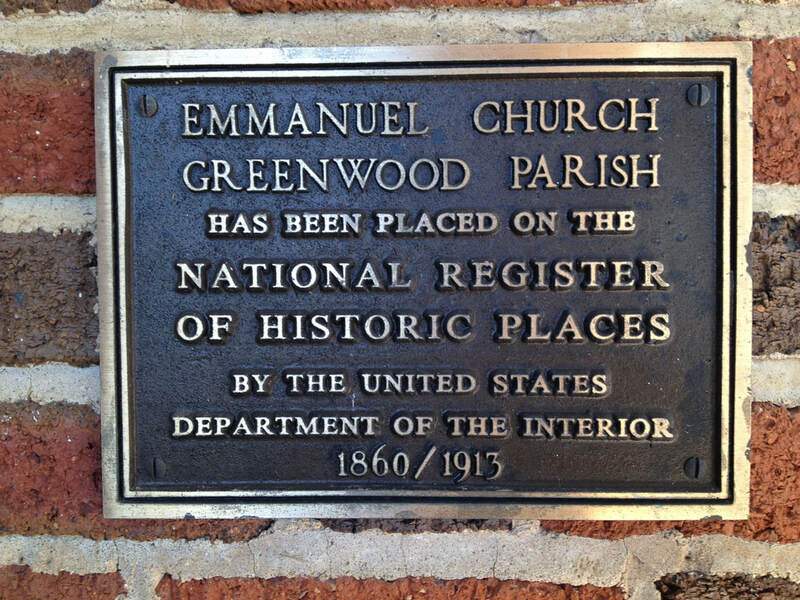 Six people hatched the plan to create the church that became Emmanuel Episcopal Church in Greenwood. Dabney Carr Terrell Davis and his wife came to visit the widow Mrs. John Bolling Garrett at her home at Clover Plains (now Seven Oaks). She was the only Episcopalian in the area. The Reverend. D.C.T. Davis was also a founder. He had recently resigned as the rector of St. Paul’s Ivy and Buck Mountain Church. Construction began in 1862, a courageous and faithful undertaking, given that the Civil War was underway and there was great hardship and uncertainty throughout the country. A new church at the site of Lebanon Presbyterian Church was built at the same time, using the same plan, same builder, and same bricks—which were fired and hauled from the nearby Piedmont estate. The cost to build Emmanuel was $2500. About 15 people attended the first service at Emmanuel on Christmas Day, 1863; it was conducted by Rev. D.C.T. Davis, who lived in a log parsonage nearby. Davis couldn’t get by on the meager salary available at that time, so he left Greenwood for better pay. The church made it through the war years with the support of itinerant preachers who traveled. 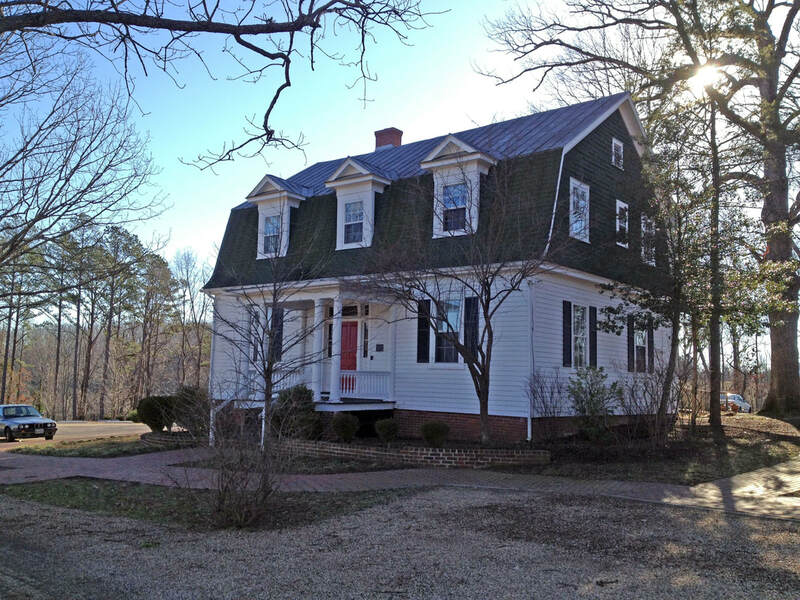 Greenwood became a refuge for northern Virginians and others escaping the invasion of federal troops. Many took shelter at Mirador, Fair View, and Clover Plains. The Dinwiddie School at Greenwood Depot became a hospital for wounded soldiers. There were no battles in Greenwood until after the battle of Waynesboro in 1865, when fleeing Confederate troops, pursued by the Union army, had a skirmish at the depot. In 1868, Emmanuel was consecrated—meaning it was debt-free. 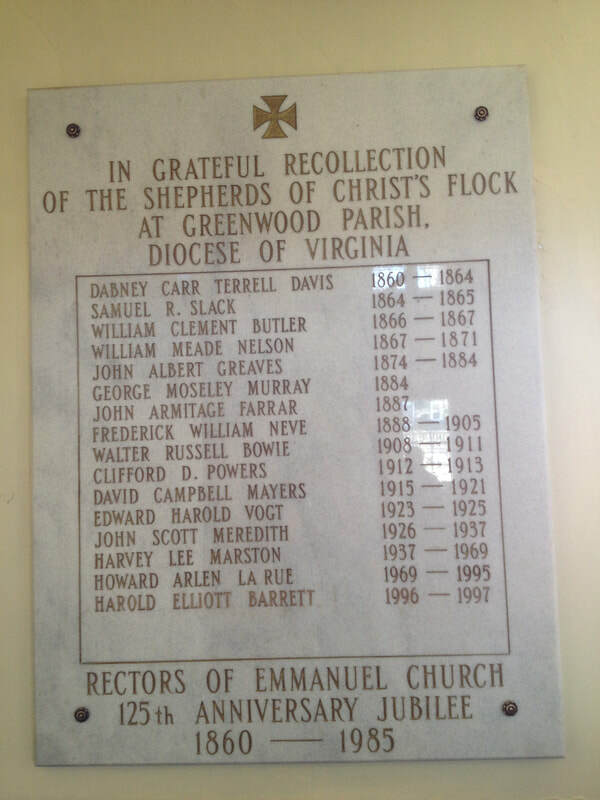 St. Paul’s Ivy and Emmanuel Greenwood were united under the same rector, an agreement that was to see both churches through the financially strapped Reconstruction era and into the next century. For some reason, it happened that all rectors serving the combined churches were from England. Services were held twice a month. Even with two congregations, the salary was not always paid and reductions were frequent. It was hard to keep rectors for long. Emmanuel was vacant throughout 1872 and 1886 as well as other periods. Being the smaller of the two churches, Emmanuel had just one service a month as rectors came and went. It wasn’t until the mid-1920s that Emmanuel became solvent. So began Neve’s celebrated career. He came to Albemarle County and remained until his death, spending 17 years (1888-1895) as rector for Greenwood Parish. He built his first mission church in 1899—St. John the Baptist near Batesville--with his own money as a memorial to his mother. Under his leadership, Holy Cross in Batesville and St. George’s Chapel in Crozet were built. Services were held at St. George’s from 1899-1941. Today, a small altar and plaque in St. George’s Chapel inside Emmanuel church testifies to its vital place in our church’s history. Emmanuel still maintains a close association with Holy Cross through Bread Fund and other ministries. Neve went on to found 30 churches, numerous missions, schools—including the Blue Ridge School in Dyke (St. George), which began as an industrial school campus—medical facilities, and the Order of the Thousandfold, an order of prayer open to all. He brought faith, education, and medical assistance to the isolated reaches of the Blue Ridge region, stretching from Albemarle to Rockingham to Loudoun counties, often traveling alone on his horse, Old Harry. It would take a book to detail the contributions of this remarkable clergyman. An Emmanuel parishioner has done so: Neve: Virginia's Thousandfold Man by Frances “Jack” Scruby is an excellent resource. Neve was particularly influential in the spiritual development of Nancy Witcher Langhorne Astor, who was the first female member of British Parliament to take her seat. Mirador served as Nancy’s childhood home. The finances of her father, Chiswell Langhorne, were decimated by the Civil War but went on to make a fortune in tobacco and railroads. Nancy, who was later known as Lady Astor, lived at Mirador from 1892 to 1897. Her sister, Irene, who married artist Charles Dana Gibson and was a model for the “Gibson Girl,” also spent part of her youth at the estate. You will notice these family names among the plaques on the walls of our church. As a teenager, Nancy rode with Neve to visit people living in the Blue Ridge mountain country. She never forgot what she had seen of the poverty and deprivation of these remote communities. Neve answered here countless questions about Christ, God, and Christianity with patience and wisdom. These journeys marked a lifelong friendship and a shared love of Christ. Nancy and her mother, Phyllis Langhorne, gave Emmanuel a bell tower in 1905. The original bell came from a locomotive and was later replaced. One can see the outline of the doorway that used to be the church entrance. The door was relocated during the 1914 reconstruction. In 1908, a rectory was built next to the church under the supervision of Dr. Owsley, who lived next door at Tiverton. It is now known as the Marston-LaRue House. It was first occupied by the Reverend Walter Russell Bowie and his bride. After Mrs. Langhorne died, her children rebuilt Emmanuel in her honor in 1914. Local rumor held that the money to restore the church was won at the Ascot Races—a good possibility since Lord Astor had the finest racing stable in England. The small church was replaced with a new one on the same spot, including a Parish Hall with connecting arcades. Waddy Wood, a famous architect who built well-known residences and commercial buildings in Washington, DC, designed the new building. At the time, few churches were built to accommodate programming like Sunday school and fellowship, so Emmanuel’s new design was ahead of its time. Several older elements were incorporated into the new. The “tray” ceiling from the old church was placed in the new Parish Hall and circular windows from the bell tower were put in the new bell tower. With the exception of moving the organ from the first floor to the gallery, relatively few changes have taken place since the 1915 reconstruction. Besides Frederick Neve, Emmanuel has been blessed with other memorable rectors. The Marston-LaRue House now serves as the Parish Office. It is named for two former rectors: Lee Marston (1937-1969) and Howard LaRue (1969-1995). Many parishioners who still attend have many memories of them. During WWII, the church was split on whether to display the American flag inside as a show of support for our troops. Rev. Marston, a pacifist, fiercely opposed the idea. During one Sunday service, a flag was unfurled from the choir loft. Whereupon, Rev. Marston stopped the service and ordered everybody out of the church. After private conversation with members of the Vestry, the flag was removed and services resumed. Apparently, it came down to a choice between the rector or the flag! Both the church and the Marston-LaRue House suffered minor fires. Each time, flames were extinguished before any major damage. 100 Years of Serving Our Lord- 1860-1960, by Langhorne Gibson, Sr.
Help Yourself to the Butter- Remembrances of the Reverend H. Lee Marston, His Family and Friends by Minor Lee Marston is available from the Marston Family. This is the table, not of the Church but of Jesus Christ. It is made ready for those who love God and who want to love God more. So come, you who have much faith and you who have little, You who have been here often and you who have not been for a long time or ever before. ​You who have tried to follow and all of us who have failed. These are the gifts of God for the People of God. Adapted from The Iona Community, Iona Abbey Worship Book, (Glasgow, UK: Wild Goose Publications, 2001), 53.